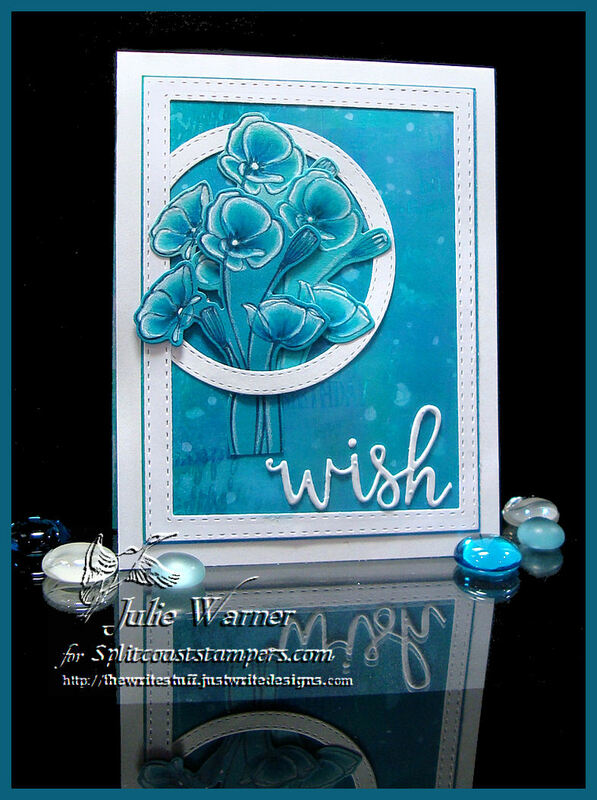 Such a lovely site for the Splitcoast Inspiration Challenge! After much window shopping, I chose THIS picture for my inspiration. My colors ended up being a little more blue than green, but that’s how it goes sometimes. 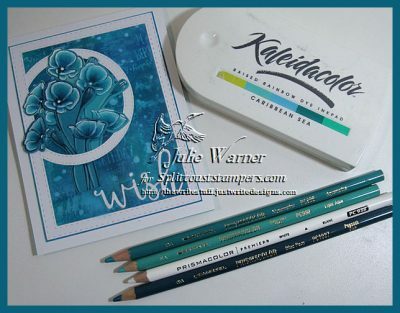 For my card, I stamped the lovely poppies onto 3 slightly different shades of teal using teal ink. I colored them all w/ the same Prismacolor pencils then die cut w/ the matching die. 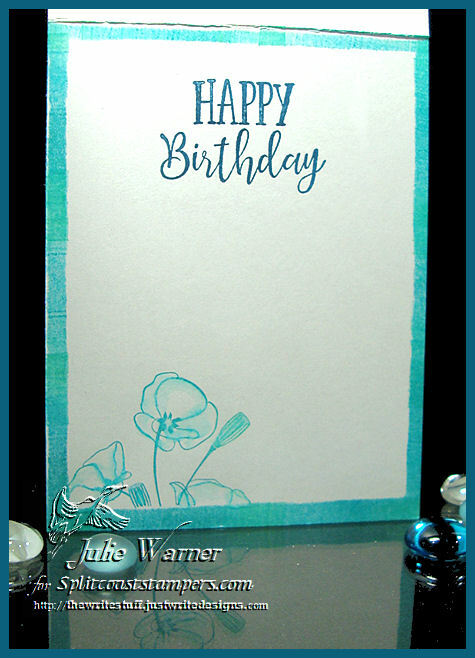 The background was done on glossy card & I stamped a bunch of different Birthday greetings w/ clear resist ink then brayered over it w/ a Kaliedacolor rainbow ink pad. I spattered it a little w/ wet paintbrush then dabbed off the water drops. The resist images were very easy to see at first (you can see it in the pic w/ the Prismas, below), but by the next day when I took the rest of the pics, the words had just about faded into the bg & only the water splats remained. 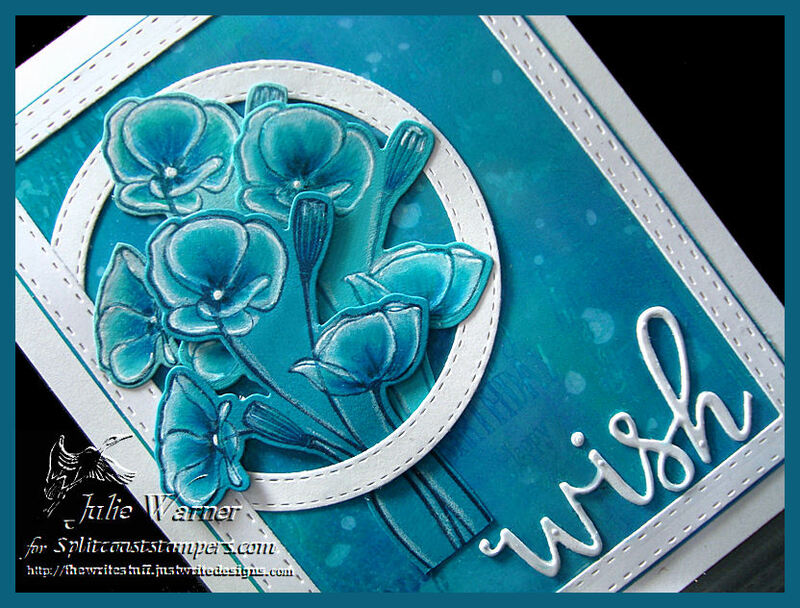 I used a circle & a rectangle frame to give my image & bg a little punch then added the die cut greeting. It actually says Wishes but I trimmed off the es. Here’s the inside & below it are the Prismas I used. Serendipity Nov Blog Hop #1! 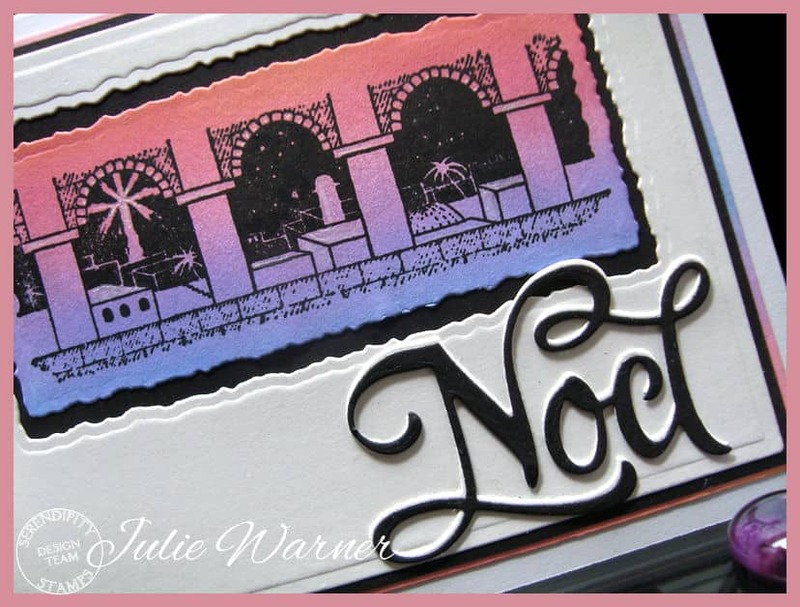 Welcome to the Nov #1 Blog Hop for Serendipity Stamps! If you arrived here from Miriam’s blog, you’re in the right place..if not, you may want to head over there first. The Prize – One $20 gift code will go to one random commenter from the blogs. So be sure to visit all the blogs because you don’t know which one the winner will be drawn from. You have through Sunday Nov 5 to leave comments on the blogs for a chance to win. Mary will announce a winner on Nov 6 on her Blog. Each month a different image is 50% off. This month- it’s the Sled! On the first & third Wednesdays of every month., we’ll be celebrating with a Blog Hop! To make my Christmas card, I started by making a brayered background using just the pink, purple & blue part of a Kaleidacolor rainbow pad. 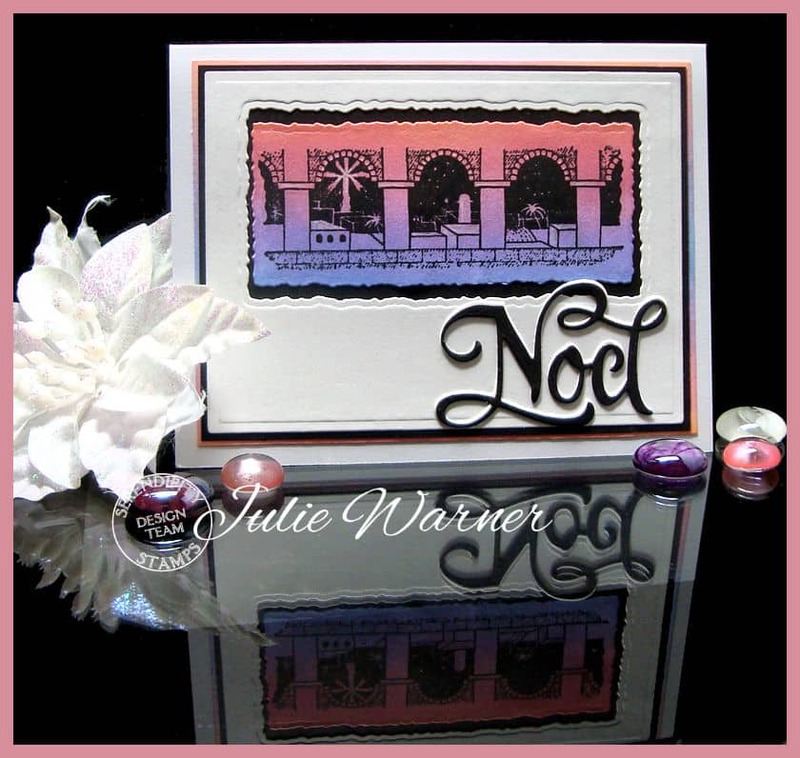 The Bethlehem image was placed into my Misti & stamped several times (to get good coverage) onto the background. Since the image has a deckled look to the edges, I die cut it and the white frame layer inside using some long deckled rectangle dies. A larger black layer was attached behind then I attached the Leftover rainbow layer behind the black. 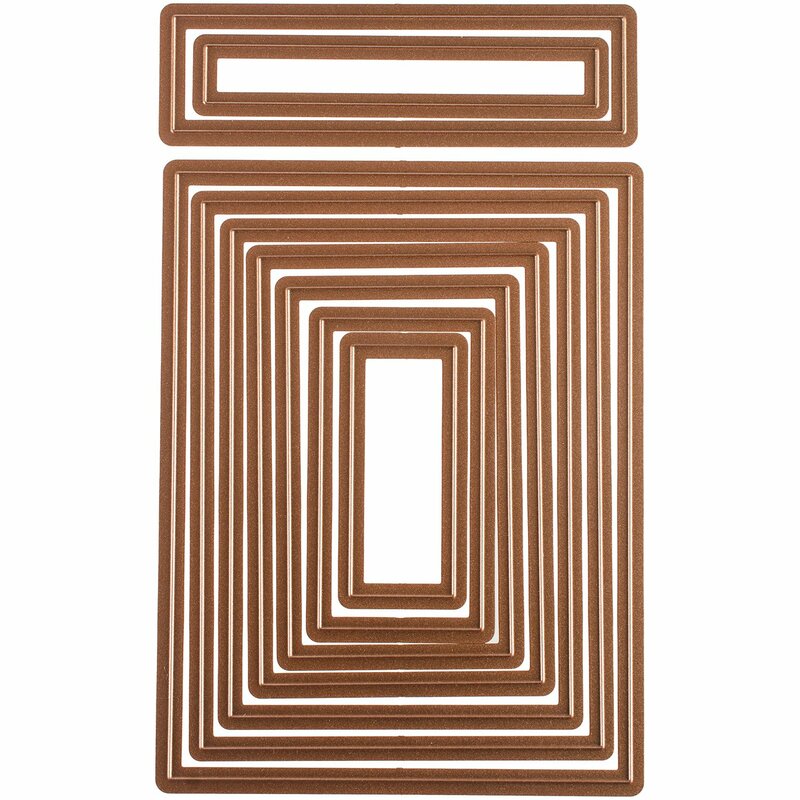 The Noel was die cut once in black & once in white & stacked. Next stop is Vickie’s Blog! Please be sure to comment on all the DT Blogs..it will be so appreciated & also increase your chances of winning! 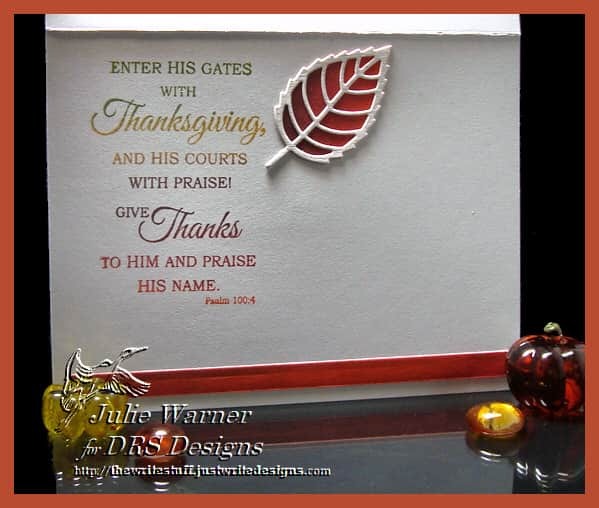 Today’s Color Challenge (CC605) on Splitcoaststampers, is a collection of wonderful fall colors w/ the dessert of using a leaf or two. I used a bunch of left over pieces of white linen & plain white card stock. On the small linen rectangle, I used a rainbow pad (that happened to have the right colors) to ink the greeting (sneak peek of a new item!) & stamped it. I used the same ink pad to brayer the partial panel on the left & the large frame bg then arranged all the panels together. I die cut the solid leaves out of more brayered bg & the vein overlay out of more white linen. All in all, pretty quick..especially for me! Here’s the inside w/ another new greeting to be released soon!